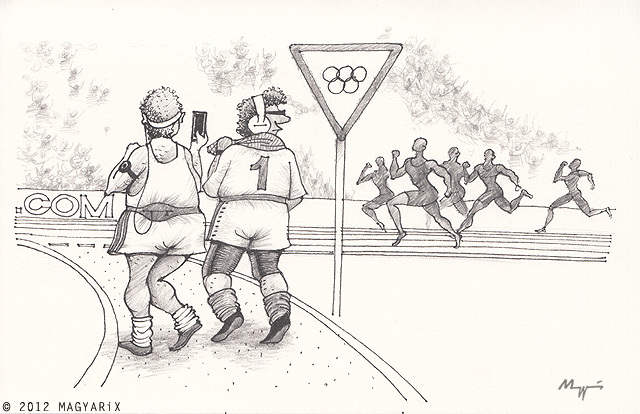 2012 Summer Olympics in London could be the first games with real public participation. Get off your seat and break Usain Bolt's 9.572! If these two start running in front of the pack it just might throw the athletes concentration off and give them the edge. While singing in church he noticed that the lady in front of him had her skirt pushed up between her legs, so being polite he reached forward and pulled it out. Well, she turned around and slapped him. So, to makes things right with her, he pushed her skirt back in. This is a riot!! Love it!!!! Great spin on the theme. reminds me now of the slow bike race we used to have at school...last one there won!